Spruce have a poor reputation as bonsai. Difficult to style, difficult to encourage the branches to set into new positions through wiring and difficult to create good ramification with little if any prospect of backbudding. Unfortunately, the ubiquitous Picea albertiana 'conica' has not helped matters; very often picked up by beginners looking for nursery trees to style into bonsai, the Alberta spruce has been known to cause great annoyance and frustration! However, there are some excellent examples of Spruce bonsai in Europe and Japan; the genus as a whole has some excellent qualities and very often, it is just a question of learning how to work with Spruce and its foibles so that the best can be made of this tree. 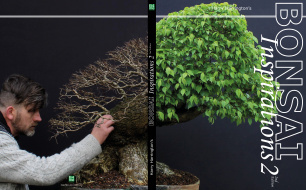 This article is primarily based on my experience of Picea albertiana and Picea pungens though these techniques can also be applied with degrees of success on all vigorous Picea/Spruce bonsai. The techniques described in this article assume that your Spruce is vigorous and that care is taken when applying these techniques to weak lower and inner branching. The easiest way to judge the vigour of a Spruce and its individual branches is to look at the number of new buds that have formed, very often at the tips of the foliage, in late Summer. Branches with no buds are very weak and are likely to fail/dieback in the following Spring. These are best left alone. Branches with one bud are weak and will tolerate minor wiring and needle plucking. Branches with two or more buds are strong to very vigorous and all of the techniques described can be applied. Spruce are sensitive to timing. In particular, styling and wiring must not be carried out while the tree is in active growth as branches are very likely to fail and dieback. In the UK, extensive styling is best carried out from late Summer (August) through to the first frosts around November. Spruce have incredibly supple branches. With the use of thick enough wire and guy wires, branches of over 1" can easily be bent without danger of snapping or cracking. Thinner mature branches can be bent and contorted in a variety of directions to bring the foliage closer to the trunk. This suppleness is also problematic; wired mature branches can take years to set into their new position, often requiring repeated rewiring. However, I found that on a number of occasions, branches that have had twists and turns put into them have set into position within a year. When branches of any tree species are wired into a new position, the cambium is broken (however minutely) and the repair of the damaged parts of the cambium layer, by the tree, sets the branch into its new position. With Spruce, it would seem that more manipulation is needed to damage the cambium in order that the tree will be prompted to repair the damage and set the branch. However, care must be taken as major manipulation of a Spruce branch in the late Spring and Summer will cause it to dieback very quickly. This is why Spruce should be styled from August onwards. After this time I have found that Spruce are very tolerate of all wiring and styling. Featuring short needles and very often an overall dense foliage mass the Alberta Spruce seems eminently suitable for bonsai but once the bar branches have been removed, the enthusiast often finds that he is left with a small number of thin, ill-spaced branches that only have foliage growing on the tips. When considering which branches to keep and those to remove, always value and retain those that have foliage closest to the trunk. Though backbudding can be promoted on Spruce, this will always be limited. Do not rely on any backbudding on the trunk or old branches unless the tree has been very heavily pruned back. 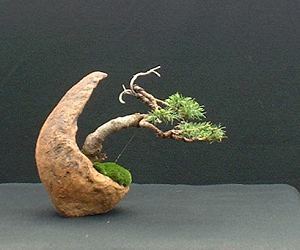 Unless a Spruce has been specifically trained in the ground for bonsai and the branches are appropriate (short with foliage near the trunk), the most suitable design will be one that uses the first 2 or 3 branches with the uppermost (remaining) branch used for the new trunkline and imitates a wild tree or yamadori. If one studies pictures of good quality Spruce bonsai on the internet or in books, as with Juniper, many of the designs use only a very small number of primary branches (that is branches that grow directly from the trunk) but have had many secondary and tertiary branches developed to greatly increase ramification and foliage density. Unless you have suitable raw material with the appropriate sized trunk and short branching, informal or formal upright Spruce bonsai are very difficult to style realistically or to any real quality. Left to their own natural growing pattern, Spruce will produce one flush of growth each year. New shoots extend from buds set in the previous year; these buds are nearly always at the tips of the branches. Backbudding without some kind of pruning regime is very rare. Without some forward planning and planning, all the needles of the tree will be on the tips of the branches leaving otherwise bare branches.